When fully opened, DANM Program Manager, Felicia Rice’s book literally unfolds like an accordion along the length of a 30-foot table. The product of a seven-year collaboration, DOC/UNDOC (Documentado/Undocumented Ars Shamánica Performática) is a multi-media—and multi-faceted—modern art book that explores the meaning of identity, legal documentation, racism, and appearance. It’s also the title and focal point of a new exhibition at UC Santa Cruz’s Sesnon Gallery, running October 3 through December 6. Opening the case triggers light and interactive sound art by music lecturer Zachary Watkins. The book also includes performance texts about the politics and personal experience of immigration by writer, performance artist, and MacArthur Fellow, Guillermo Gómez-Peña, plus critical commentary by professor and art historian Jennifer González. “In this case, the art piece is interactive in new ways, utilizing contemporary technologies in an unusual context,” she added. At the Sesnon Gallery, the book stands upright and snakes through the gallery on a specially built table. Its aluminum case is plugged in with headphones and participants can push blinking buttons to hear 48 short tracks—“some descriptive, all provocative,” including soundscapes, poetry, and street recordings. The video plays simultaneously, and sound fills the room. Rice came to UC Santa Cruz in 1974 to learn the craft of letterpress printing and the art of bookmaking. In 1977, while still a student, she also founded Moving Parts Press in a garage downtown and began her career as a printer, teacher, literary/fine arts publisher, and book artist. She received her degree in 1978 from UC Santa Cruz as an independent major in Fine Art Printing. Rice added that creating and producing a limited edition artists’ book can be extremely labor intensive. 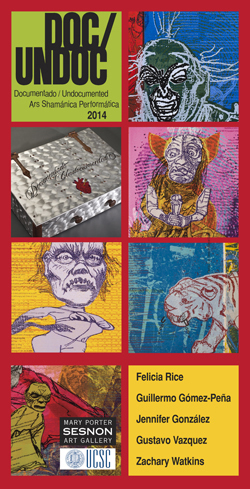 An opening reception for the exhibition takes place on October 15, from 5 to 7 p.m. at the Sesnon Gallery. Felicia Rice will also perform a series of monologues about the making of DOC/UNDOC on Oct. 22 at 7 p.m. at the gallery. For more information about related events, visit the Sesnon Gallery web site or call (831) 459-3606.